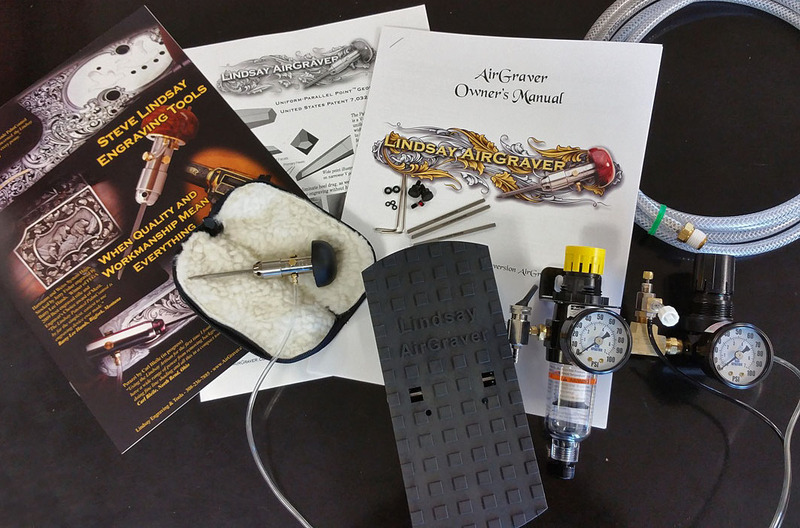 This an auction for a Steve Lindsay Classic system to get you started engraving. I want to thank everyone who attended this years 13th Annual Engrave In for all the entertainment and edification that we all gave each other. I want to THANK Steve Lindsay for being the great supporter of this event for so many years. Next year I am promised that certain individuals will drive through Kearney , Nebraska and kidnap him to ensure his attendance at #14. But meanwhile, this year Steve is graciously donating one of his Classic Engraving systems to help cover Engrave-In expenses. Steve is of course, one of the world’s most reknown engravers and now manufauctures the superb engraving tools of the highest magnitude. I personally think the Lindsay Palm Control is without a doubt the sweetest system of all to make cuts in steel. The Classic is the next in the line-up and is also a great system..
ALSO: Included with this auction is one day of training from Scott Pilkington. This 8 hour instruction period can be done in person in his studio in Monteagle Tennessee, or can be done hourly via Skype or Facetime. Basically you are getting a $1800 value and supporting a GREAT event for the engraving community. Bid high, and bid often. below this post. Re: Auction for Lindsay Classic and private tutoring. Wow, What a great opportunity. Thank you Scott for the work you do every year to put the Engrave-Ins on! Here is a photo of what is up for auction. Think I'd prefer a PalmControl. That said, the Engrave In is such a wonderful thing and great cause to support. On top of that you get a day of training with Scott Pilkington! Just gotta put a bid in on this. I'll bid $500. Scott, is the training and classic combined as one package or separate bidding for the two? Hi Jeff, missed you this year at the Engrave In. I was doing it as a package but PM if you want to come up separately. Thanks Scott, may do once we get past the holiday. Hollis is the winner at $1320.